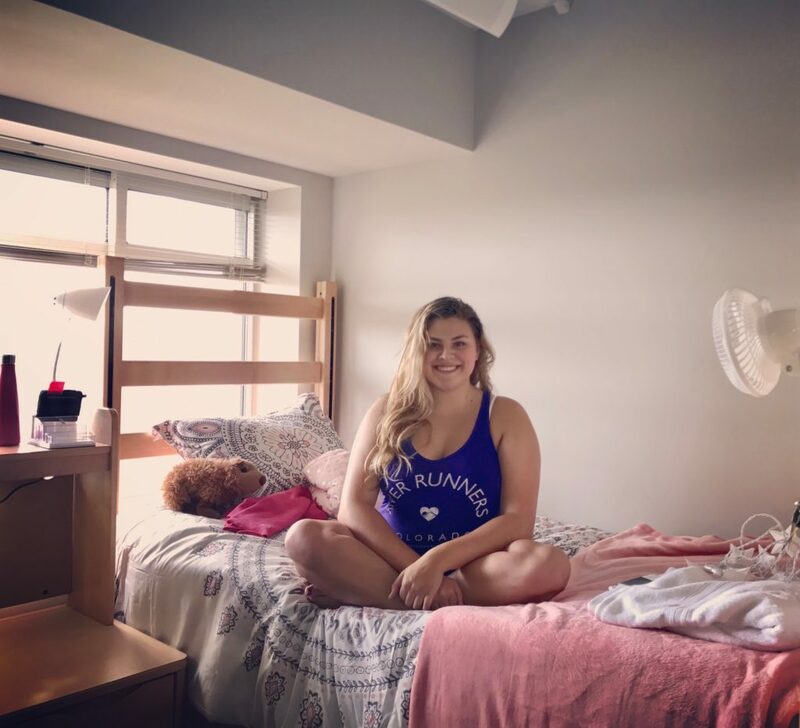 Paige Habiger sits on her bed on the day she moved into her dorm at the University of Kansas. A few weeks later, Paige was in downtown Lawrence when shots were fired in her vicinity. Though she was unhurt, the incident left her and her parents shaken. At 2 a.m. on Oct. 1, my wife received a text message from my daughter Paige. Text messages at 2 a.m. are never good. As a freshman at the University of Kansas, Paige had attended Late Night at the Phog, the official opening to college basketball season. Practice can officially begin at 12:01 a.m. that date, and KU has built a whole day around the event. Afterwards, she and some friends went to downtown Lawrence. At about 1:30 a.m. shots were fired. Five people were shot. Three died. Paige estimates that she was about 20 feet away from where the shots were fired. Although getting a text at 2 a.m. is scary, we at least knew Paige was unharmed and safe. Just a few houses down my street another mother wasn’t so lucky. Her phone call that morning was much different. Her daughter had been shot and killed. Leah Brown, the girl that was killed, was a 2013 graduate of Bishop Miege High School. Her family lives just down the street from me. Her brother Anthony is a friend of Paige’s. According to the Kansas City Star, Brown went to Lawrence to avoid the violence in Westport. I can’t imagine what the family is going through. Paige came home that day because she wanted to be with her family after such a traumatic event. Leah is never coming home. My heart sank throughout the day as I watched family gather at their house and news crews come and interview them. I wondered how they could deal with such loss. Life is such a fragile thing. It seems I’ve spent a lot of time since The Leaven started this blog talking about death. I wrote about the death of my father and the death of my grandmother. I’m thankful now, that I’m not writing about the death of my little girl. I have a friend who recently lost his wife. It was sudden and unexpected. When I talked to him recently, he told me to give my family a big hug, hold them tight and to cherish every moment I have with them. I now truly understand what he means.